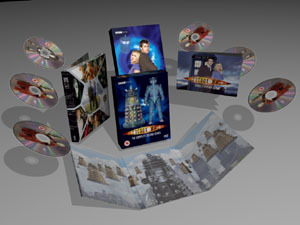 A brief overview of some 3D artwork on the new series box sets and associated merchandise, starting in 2004 with a little TARDIS and a space probe, all the way through to the Toclafane and Sontaran stuff. For the second panorama, a conceptual shot was created not seen in the TV show, showing the Master outside the Houses of Parliament. For this, masses of Toclafane were required which involved studying many screen grabs to create a detailed texture map. Oh and a few sheets of 3D paper too! 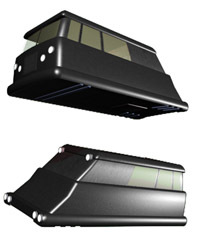 The Toclafane were also used on the volume 4 vanilla cover, lit by red to match the colour scheme of the surrounding sleeve, shown below right. It's a bit boring but I do feel it worth mentioning one other little thing. Often in computer artwork its the stuff you don't notice that takes the most time. Don't get me wrong, it's not that I'm complaining (I truly believe I have one of the coolest jobs in the world), but the fiddly bits can be quite challenging. An example on this box set was on the first page of the booklet which required a large spread of the TARDIS with Master regenerating. The only problem was, we didn't have an empty TARDIS photo exactly how we wanted. The solution - take two photos and stitch them together! The image here shows before and after I photoshopped the two disjointed images together (and removed bits of Martha) and blended them together. I also had to remove the railings and chair which were on the wrong side because the photo had been mirrored. Also other details like the lettering over the door had to be mirrored back again. The devil is in the detail! What Doctor Who work would be complete without some Daleks?! I provided three of them hovering in the background for the volume 2 vanilla, and there are two more floating around on the fold-out flexi packs. Also for the exclusive Woolworths box set, I knockd up a pair of Dalek gun and arms for the perspective shot of the Doctor and Martha being menaced through a Dalek's-eye-view. Left is the Guinevere probe used for the back of The Chrismas Invasion vanilla release. On the right is the TARDIS which is used on the back of each vanilla and on the front of the Satan Pit vanilla also. 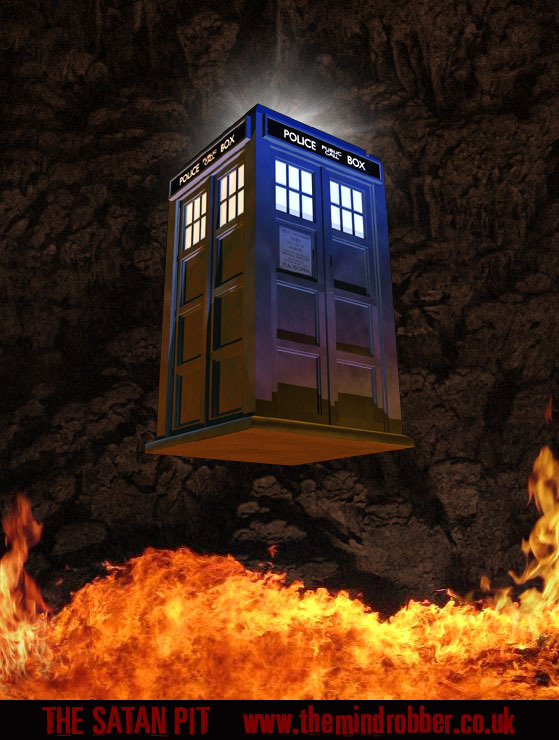 This image is used on the Doctor Who artwork page also for the TARDIS falling into the fire of the Satan Pit. Shown left are four of the TARDIS renders used on the Vanilla covers. 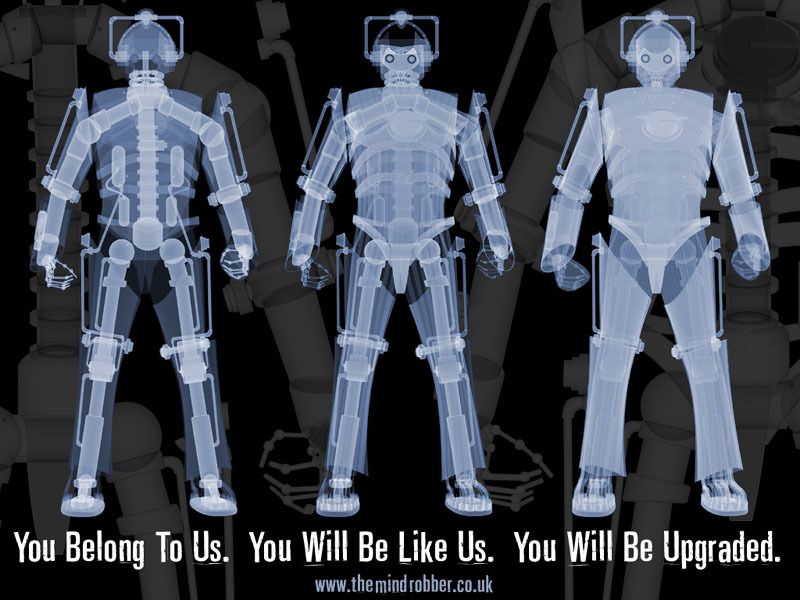 Below is the artwork for the Cyberman X-ray which appears on the box set. It didn't want to look too over-complicated. There was a danger of showing too much detail so that you can't really make much out of any part of the shape inside. I wanted things like the joints in the hands and the "bones" of the legs to be clearly visible. Hopefully from the close-up image on the right this is achieved, although some work had to be done to try to marry up the outside rods of the costume with where the actual limbs of any human actor would seem to be. There are instances where the tubes and bolts of the suit bear no relation to the cross-bars and joints of the human operator. Below right is the corresponding Dalek X-ray for the back of the box set. 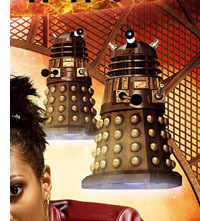 The main image below is a render of the Daleks used for the scene outside the Torchwood tower. The X-ray was then coloured in layers to brings out the different parts of the Dalek creature. Not too much internal detail was included so as not to cloud the view of the interior. Below is an alternative version of the final inside spread complete with explosions and destruction of London buildings which was never actually seen on screen! On the right here is my final pack-shot render which is a 3D visualisation of how the finished article will look. This is useful to have available to send out to companies before the final packaging has actually been manufactured as it allows for promotional and advertising work on the forthcoming product to begin before there's actually anything to photograph. Doing it in 3D also allows for more flexibility to posing the products. You'll have seen this pack-shot everywhere including Doctor Who Magazine.